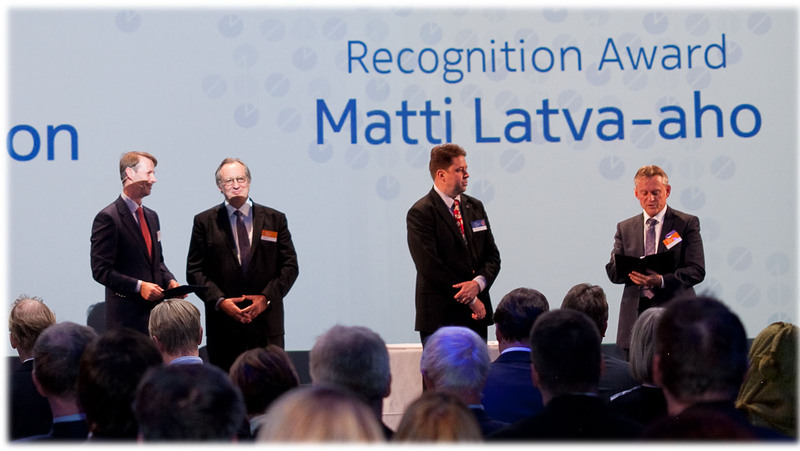 Chairman of the Nokia Foundation Board Timo Ali-Vehmas reading the Diploma of Matti-Latva-aho in the Nokia Foundation Awards Ceremony. On the left Chairman of Nokia Risto Siilasmaa and Nokia Foundation Officer Timo Känsälä. Nokia Foundation has granted a Recognition Award for the great contributions to the advancement of radio technology and its application to wireless access standards creation, as well as for your leadership in the Finnish radio technology research and development community. You are known as a pioneer in the development of air interface and link layer technologies applied in the 3G and the 4G cellular networks, with foreseeable applications in the evolving 5G systems. You have been a research leader in radio access technology in several national and international research activities that have had a significant impact on the wireless technologies, standards and their business applications. You have served as the Director of Centre for Wireless Communications at the University of Oulu, contributing to its development into a highly international center of excellence in radio and wireless technologies.